I am developing a web app that needs to be available on desktop, tablet and mobile. I know already about responsive design, media queries and all that stuff, but my question here is more about resolutions. So, this has probably being asked several times already, but i'd like to have some up to date details about it. If I have to design a responsive app, what steps do you think I should use for media queries? But the resolutions displayed here are quite a lot. Do you think that using the default 768px for tablets it's still correct? And what do you think should be the smallest supported resolution? 320px or more? Rather than thinking about screen widths, think about the content. New devices are released all the time so the best strategy is one that's based on your content rather than targeting specific devices. Assuming you're approaching this mobile first, start at the smallest width and widen the viewport until your content dictates that a breakpoint is necessary to keep line lengths for text readable, to give the best navigation experience, comfortable whitespace etc. Keep expanding and adding breakpoints as needed. This approach works even better with element queries to target specific components rather than the entire screen. Later on, he gets his tablet and does task Y. The screen size is roughly the same with his setup for task X, yet the needed contents are different. This is really what responsive design is about. You might prefer to base your assumptions on "device and task" more than on screen size and resolution. However, some common breakpoints still exist. 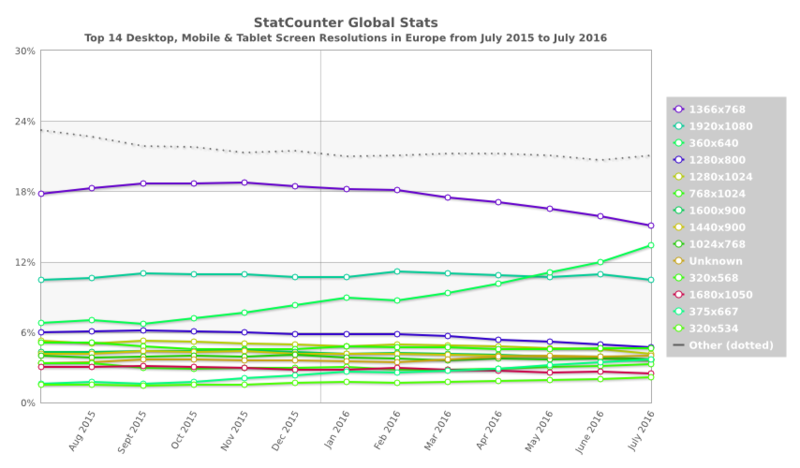 I think you should support resolutions with 360px width and below because they constitute approximately 21% of all currently used resolutions (according to statcounter). 320px resolutions constitute approximately 7-8% of all resolutions. For the tablet resolution the 1024px width breakpoint is most suitable because the majority of tablet resolutions begin with 1024x600. However, depending on your interface you should try to support at least 95% of the resolutions. This means support for 320px width. I second Matt's response. It's fine to reference guidelines like Material Design specs, but don't take them as hard rules. Ultimately if you adjust your breakpoints to fit your content, your site will look good on any device. Not the answer you're looking for? Browse other questions tagged responsive-design screen-resolution or ask your own question. Using a Timeline in a Responsive Design?